Wednesday of Holy Week is called Spy Wednesday because it commemorates the day Judas went to the Sanhedrin to confirm the plot to betray Jesus. It seems that Lady Gaga has taken the opportunity to release a twisted song about her love of Judas. The mystery of Judas is very deep. Over the years, many people have tried to expound on what happened with this iconic betrayer. The 1971 Rock Opera, Jesus Christ Superstar, is another modern example that gets Judas wrong. Some people mistakenly think that poor Judas was doomed by fate and had no choice–a mere pawn. 'In this city, in fact, both Herod and Pontius Pilate, with the Gentiles and the peoples of Israel, gathered together against your holy servant Jesus, whom you anointed, to do whatever your hand and your plan had predestined to take place.' For the sake of accomplishing his plan of salvation, God permitted the acts that flowed from their blindness" (## 599, 600). Seen in this light, there might be a deeper meaning to Judas. Could it be that our merciful Jesus was doing everything possible to win Judas back even before the betrayal? At the Last Supper, Jesus mentioned the betrayal out loud. He also performed an affectionate gesture of offering a hand-dipped morsel to Judas. This might have been Jesus reaching out to Judas, inviting him to rethink the satanic plans of his heart. 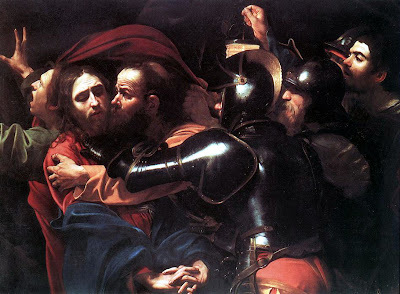 Judas and Peter both betray Jesus. Both Judas and Peter were remorseful for their betrayal. Peter's humble repentance leads to mercy and forgiveness. Judas' prideful remorse seems to lead to despair. Like Judas and Peter, we all betray Jesus every time we sin. Let us pray for the grace of true contrition for our sins, a contrition which leads to mercy and forgiveness!